Piotrowski has gone live nightly on WPDE for the past 25 years, and recently received the South Carolina Meteorologist of the Year award from the South Carolina Broadcasters Association. WPDE chief meteorologist Ed Piotrowski stands as a pillar of strength through our local storms. During Hurricane Florence, Piotrowski hunkered down at the news station to work 102 hours in seven days. 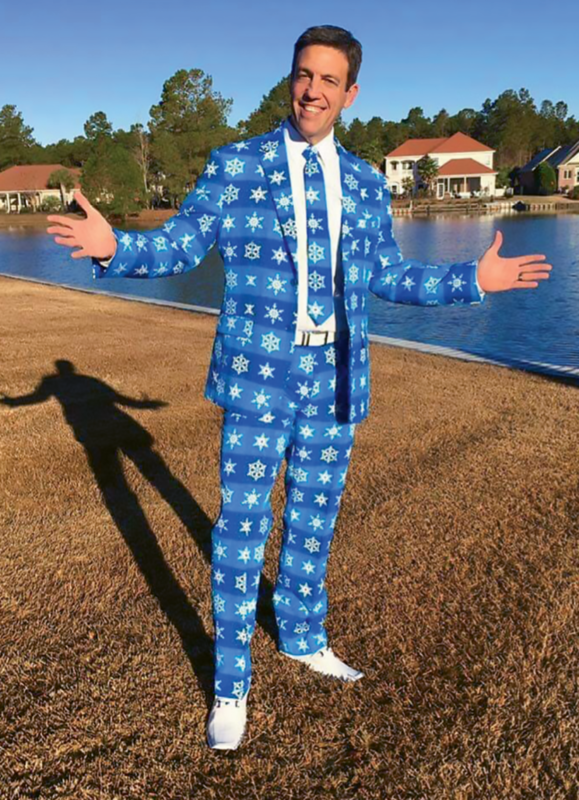 Full of personality, Piotrowski wears this “snow suit” in local holiday parades. Piotrowski makes about 150 appearances a year at local charitable events, like the annual Polar Plunge (wearing his full suit). “In the Pink” Breast Cancer Awareness Walk. Chief meteorologist Ed Piotrowski is like a ray of sunshine through even the most ominous of storms. But don’t mistake that to mean that he plays up or makes light of a serious situation. Let’s just say he clears the clouds of sensationalized confusion that we’ve all been bogged down by lately. And that’s why he’s loved and trusted by his millions of viewers both day and night, and twice named South Carolina Meterologist of the Year by the South Carolina Broadcasters Association. Public acceptance is an understatement when it comes to Piotrowski. He’s been considered the voice of reason in front of the green screen for the past 25 years. And lately, that’s been vital, with an active hurricane season that put our coastal Carolina area in the destructive paths of Hurricane Matthew in 2016 and, just in September, Florence. Millions tuned in to either his live TV broadcast or Facebook Live streams to seek his advice on hurricane prep, evacuations, the projected path and the aftermath of cleanup. More specifically, Piotrowski says his Facebook stat insights show that from September 8–30 his posts had 7 million views and his videos, 6 million. He also answered all of the 2,440 questions he received via Facebook messenger. “I guess that comes from my mom and dad, who instilled in me to never blow anyone off,” he says. Piotrowski grew up as a military brat, moving from town to town throughout his dad’s 30-year career with the Marines as a master gunnery sergeant E9 with covert helicopters. He was born in Hawaii, lived in south Texas for a while and house hopped throughout the South. Nicknamed “Special Ed” in high school, Piotrowski says he gets his even-keeled manner in stressful situations in the field from his dad. But he did know he wanted to pursue a career in meteorology, so he majored in the science at North Carolina State University, the closest school to where his dad was stationed in eastern North Carolina. After Piotrowski interned for two years at a local station in New Bern, North Carolina, he finally caught the TV bug. In 1990, with a supply of demo tapes and a bachelor’s degree in meteorology in hand, he rose up the ranks at the local station in New Bern, but decided to transfer here to ABC 15 in Myrtle Beach in 1994. And, with a 25-year tenure, he has no plan to leave. Piotrowski, 51 (52 in December), has certainly established himself as a weather god in our area, but he says he never rests on his laurels. 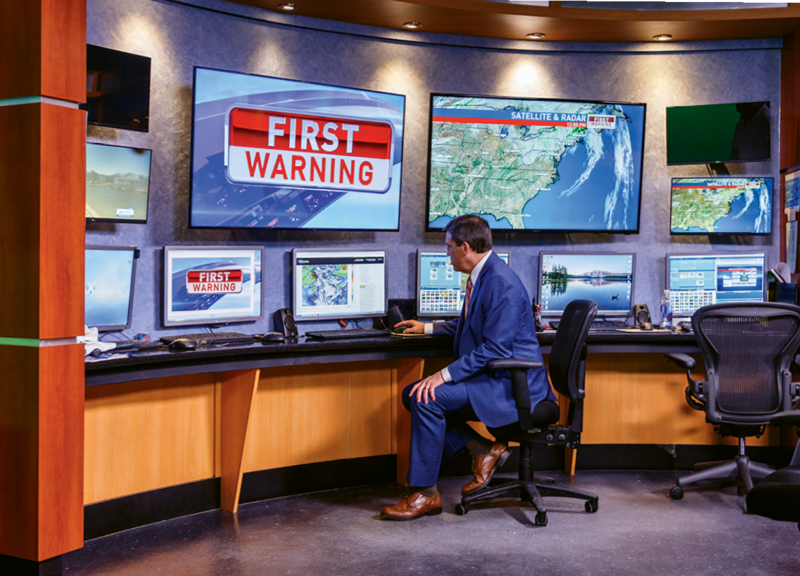 It’s his voice that’s heard loud and clear over the noise of other weathercasters who may try to sensationalize a storm for the sake of ratings. In preparation for Hurricane Florence, he boarded up his home (which made his neighbors nervous) and made sure his wife, Cindy, and his mom and dad, who live with them, were safely evacuated before he hunkered down at the news station. Piotrowski, however, stayed put to work 102 hours in a seven-day period from the weather office that he says has a nice recliner and showers in the bathrooms. And no amount of weather technology or satellite map is going to soothe the high anxieties of those in the path of a potential Category 5 hurricane. However, the humbling part about his job, he says, is the continued limitations of the science. “There’s been a tremendous amount of progress made in forecasting and the technology is a lot better,” says Piotrowski. “But, in the end, you still can’t sample the atmosphere around the entire globe perfectly. So, in other words, for our forecast models to work, we need a perfect picture of what’s going on in the Earth now. But three-quarters of the Earth is water, and no one is living on water, so we have very little data over the ocean. When Piotrowski isn’t preparing viewers for the unknown in the atmosphere, he makes about 150 appearances each year at schools, charitable events for organizations like the American Red Cross, and festivals. When he has any sort of downtime, he likes to just lie on the couch and watch football or take photos of lightning, sunrises and sunsets. Piotrowski says he doesn’t have retirement in his forecast anytime soon—maybe by 61. And we love that he’s here to make that happen for us.